Gauge is not needed for this project. Note: The head, body and wing are worked separately and sewn together with yarn tails. The tail and beak are worked directly onto the bird. Round 1: (right side) Slip stitch in 2nd chain from hook, single crochet in next chain, half double crochet in next chain, double crochet in next chain, triple crochet in next chain, 4 double crochet in last chain; working in opposite side of chains, triple crochet in next chain, double crochet in next chain, half double crochet in next chain, single crochet in next chain, slip stitch in last chain – 14 stitches (including slip stitches). Join with a slip stitch in first slipped stitch. Round 2: Chain 3 (counts as first double crochet), double crochet in same slip stitch as joining, 2 double crochet in each of next 13 stitches – 28 double crochet. Join with slip stitch in 3rd chain of beginning chain-3. Fasten off. Round 1: (right side) Work 9 double crochet in 3rd chain from hook. Fasten off, leaving a long end for sewing. Using end of yarn from head, sew flat part of head (beginning chains and last double crochet) to rounded part of body (10th-12th double crochet on Round 2 of body for left facing bird and 17th-19th double crochet on Round 2 of body for right-facing bird. Round 1: Work same as Round 1 of body. Fasten off, leaving a long end for sewing. Row 1: With right side of body facing, join B with slip stitch in first double crochet on Round 2 of body (for left-facing bird) or in next to last double crochet on Round 2 (for right-facing bird), chain 3 (counts as double crochet), double crochet in same stitch as joining, 2 double crochet in next stitch – 4 double crochet. Chain 3 (counts as double crochet on next row), turn. Row 2: Double crochet in next 3 stitches – 4 double crochet. Chain 1, turn. 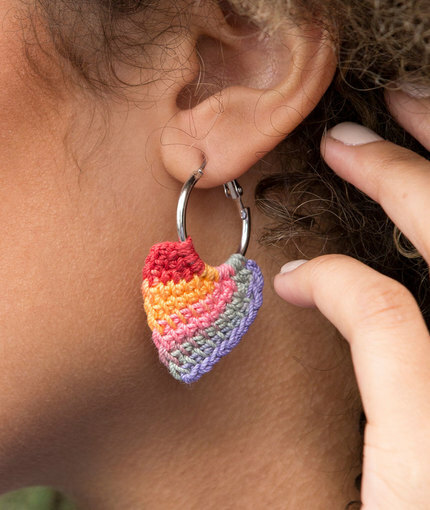 Row 3: Work (half double crochet, slip stitch) in first double crochet, (half double crochet, slip stitch) in each of next 2 double crochet, (half double crochet, slip stitch) in 3rd chain of turning chain 3 – 4 half double crochet and 4 slip stitches. Fasten off. Weave in all ends. Sew wing to body. Sew button to head for eye. 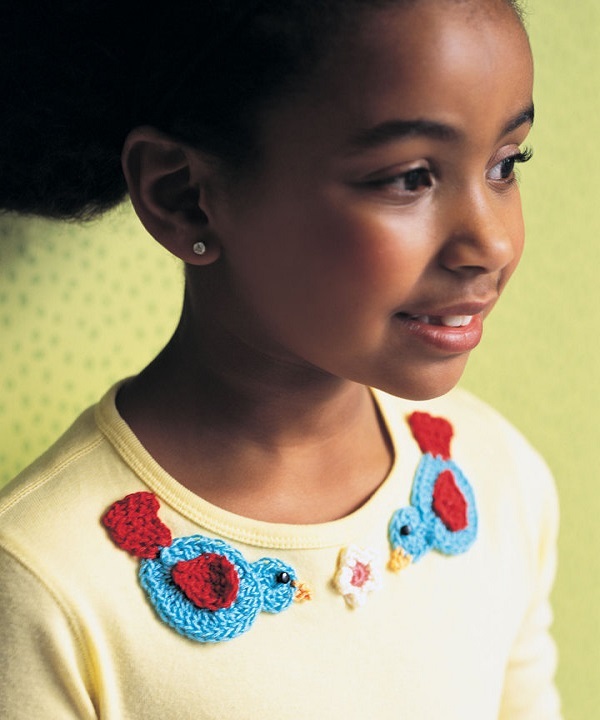 Pin assembled bird(s) to shirt as shown in photo or as desired and stitch in place. With either C or E, (center of flower), chain 2. Round 1: (right side) Work 10 single crochet in 2nd chain from hook – 10 single crochet. 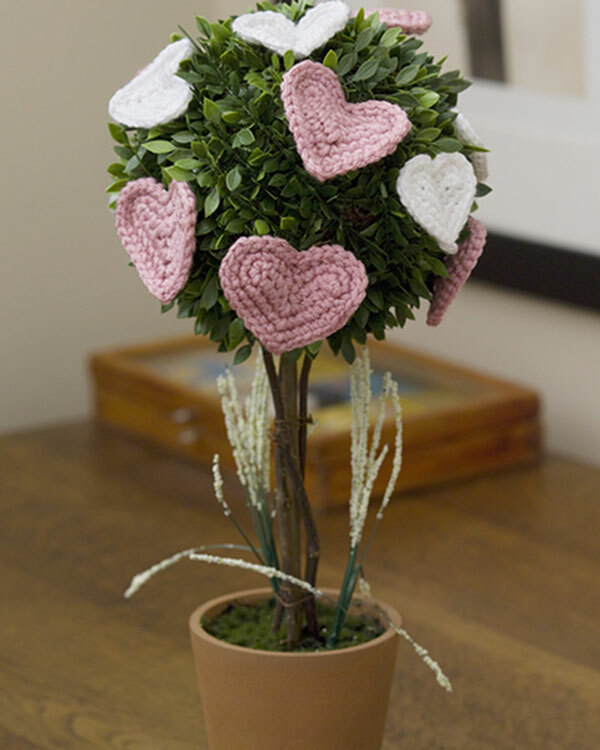 Join with slip stitch to first single crochet. Fasten off. 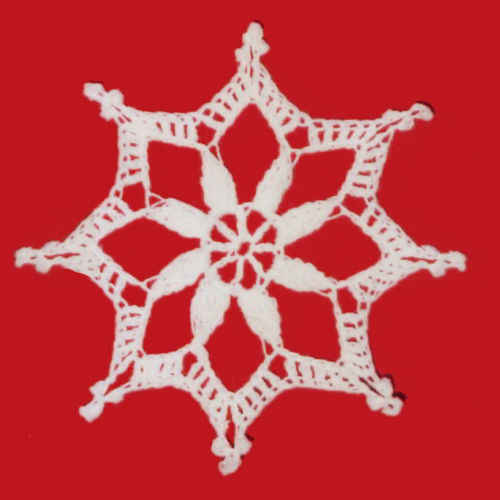 Round 2: With right side facing, join D with slip stitch in any single crochet, double crochet in same stitch as joining (double crochet, slip stitch) in next stitch; *(slip stitch, double crochet) in next stitch, (double crochet, slip stitch) in next stitch; repeat from * 3 times more – 5 petals made. Join with slip stitch to first slip stitch. Fasten off. Weave in ends. Pin flower(s) to shirt as desired and stitch in place.